Buried in a sea of guitar pedals, looping boxes, analog synths, tape recorders, found objects and percussion instruments, Deupree and Fischer settled into the 12k studio and began crafting long passages of music, with no editing, into what would become the single composition on the CD. The creative energy didn’t stop in the studio, however, as the frozen bay and snow-covered hills of a park along the Hudson River became the visual backdrop that brought the project to completion. The fruits of their collaboration could not be realized only with a single compact disc, and grew to become a boxed set containing a CD, a 7” record and a booklet of photographs. 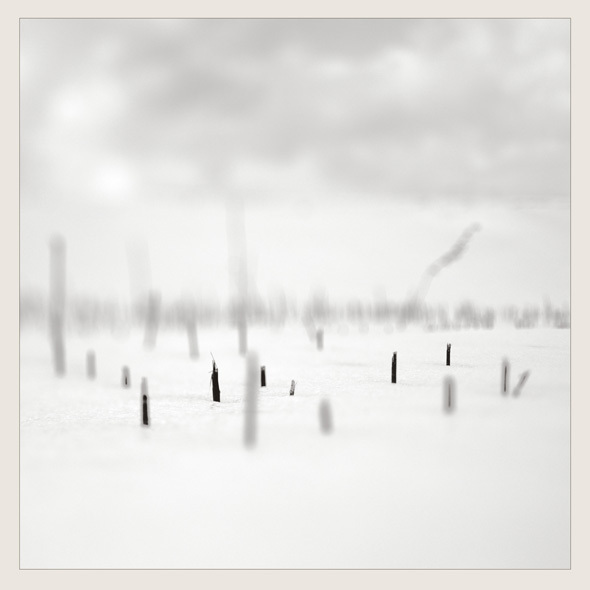 Titled In a Place of Such Graceful Shapes and limited to only 500 copies, the stark and austere package starts with a black box adorned with a monochromatic photograph of a winter landscape, with the artists’ names and the album title only appearing in tiny print on the bottom of the box. Inside, the jacket of the 7” shines in a bright, warm yellow – the only color in the landscape, provided by waterside grasses – and contrasts with the black and white photography (taken by both Deupree and Fischer) inside the booklet. A warm grey tone ties everything together on the CD and outer box to balance the color palette. The attention to detail and care taken in the packaging is echoed in the music, whose goal was laid out at the very beginning of their collaboration: to create a single long piece that barely touched surfaces, ebbing and looping in stillness and the softest of movements. Intended for quiet listening, In a Place of Such Graceful Shapes is a warmly tactile and human piece of music, free of the computers that turned the artists off in the first place. The almost 50-minute composition builds a complex ecosystem of sounds, with the faintest of baritone guitar, bells, strings and harmonica joined by simple tones from synthesizers and toy keyboards. 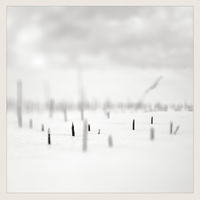 Even a bundle of sticks picked from the river finds its way into this deeply textured recording. Using passages of recordings that they did not use on the CD, Deupree and Fischer, in their separate cities, each created one side of the 7” record, using the short format to play against the long-form CD, but creating equally transcendent, melodic works. As with most of the package, the vinyl is unmarked, letting the music and imagery combine in each listener’s own way. In a Place of Such Graceful Shapes is quintessential 12k – the meeting of minds, the joining of sound and image – and is among the most ambitious projects the label has undertaken. It will be released in September of 2011, nearly a year after the work began, and will be set once more against an autumn tapering into the quiet cold of winter.